Werner's Cairns blog: The “Dragons” in my garden. The “Dragons” in my garden. I’m referring of course to my Dragon Fruits (DF) aka Pitaya. 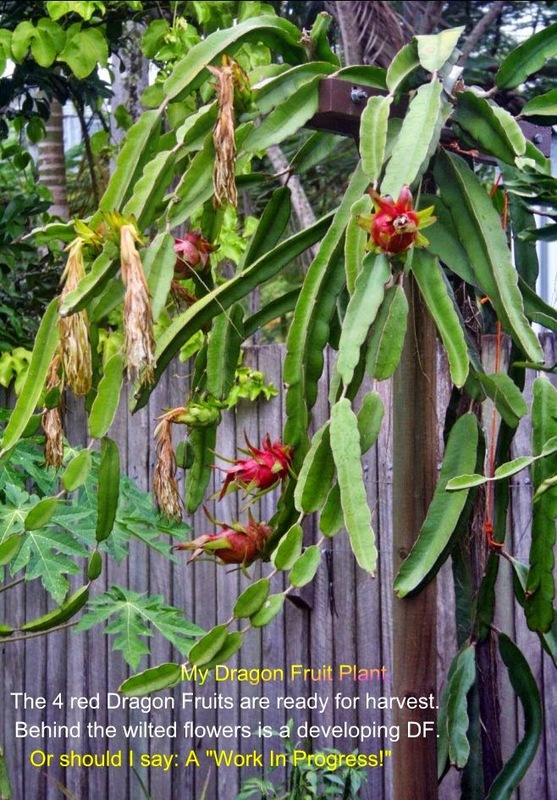 As a keen fruit and vegetable gardener I have become an accidental Dragon Fruit grower. My neighbour went to a plant sale at Masters. Their eye caught a special bargain with a lot of 20 different plants and they bought it. When they started to plant them they found a DF plant among them and didn’t have any idea what it really was or what to do with it. So they offered it to me. I had no idea about this fruit either, but being me, I was ready to take on a new challenge. I stood in front of a steep learning curve. Google helped me with some the basics. So I found a good spot and planted it and put a stick beside it for it to grow up on it. I made some phone enquiries looking for a grower to get more advice from, and I got the phone number of Dawn Meneikys in Mossman 60 Km north from here, and I contacted her. She has been growing this fruit for many years and invited me to come and see her – which I did. Dawn told me everything I needed to know about DF growing. However, I was amazed to see how many DF plants she had in her backyard. But what I realised immediately was, that the stick I put beside my plant was not strong enough to support a mature plant. So I bought a big round 2. 4 metre post at Bunning’s; mounted a timber crossbar on the top of it and cemented it in the ground. A lot of TLC followed. After 18 month, the plant started to flower for the first time, and that was November 2014; May 2015 ended the fruiting season and I have harvested in that time 32 Dragon Fruits. And from the offshoots I have now two more growing; the second one has already produced six fruits. Although the DF belongs in the cactus family, its treatment is different from the cactus that grows in arid areas and dry deserts. The DF needs a good nourishing soil; it needs water and fertiliser, preferably an organic one. I use the organic chicken pellets, and in the growing season fortnightly apply foliar spray with “Charley Carp” – diluted 10 m/l to one litre of water. The best time to do this is either very early in the morning or in the late afternoon. At this the time the plants open their pores. In my research I also found that this fruit is nutritious and has many health benefits. It is needless to say that I enjoy eating them, put the flesh in my breakfast and include them in fruit smoothies. at night, and wilts with sunlight in the morning. The wilted flower often stays on fruit till it is ready to harvest. The flower is really a “One Night Wonder”. 10 Surprising Benefits Of Dragon Fruit You Never Knew. Dragon what? No, this is not a medieval-times myth where knights save princesses from fire-breathing dragons and win the coveted dragon fruit from a magical tree. That said, real dragon fruit does contain some pretty magical benefits that can make you feel like a beautiful princess or a knight in shining armour. In tropical and subtropical regions in South America and Asia, the dragon fruit flourishes and grows in abundance. Appropriately named, the dragon fruit’s outer skin is cactus-like, resembling that of the scales of a mythical dragon. Considered a cactus plant, its vibrant green and reddish-pink hues indicate that the fruit is full of nutrients, while the creamy white or red flesh spotted with black seeds gives way to many rich and natural properties. Also known as pitaya, these fun-looking fruits contain around 60 calories each and are rich in vitamin C, B1, B2 and B3, and minerals such as iron, calcium, and phosphorus. And that’s not all. This is definitely one of the best “super fruits” out there. Dragon fruit has an extremely low amount of cholesterol, which ultimately helps the body break down this fruit quickly, keeping you happy and healthy. It’s the perfect fruit to maintain your weight and satisfy your sweet tooth. Americans have increasing problems maintaining cardiovascular health. Fortunately, this fruit has an amazing superpower that helps decrease bad cholesterol levels and replenish good levels. Dragon fruit is an excellent source of monounsaturated fats, helping the heart stay in great condition. 3. Fill Up On Fibre. To clean up your digestive system, eat a dragon fruit. They have a high fiber content, which can assist with poor digestion and constipation. Eating the flesh and seeds, which contain good protein, will keep your body fortified and satisfied. To rid the body of free radicals and cancer-producing properties, you can eat foods that contain antioxidants. Believe it or not, dragon fruit is giving acai berries a run for their money. The high amount of fibre in dragon fruit can ultimately help regulate diabetes, as it can stabilize blood sugar levels by suppressing sugar spikes. However, with any dietary changes or modifications, always consult your doctor to make sure this is a good food for you. 6. Reduces Signs of Aging. Eating a dragon fruit with its rich antioxidants can keep the skin tight and young. You can even make a face mask using the fruit combined with honey as a natural alternative to anti-aging masks. Dragon fruit juice is an excellent agent for treating coloured hair. By simply putting the juice or a conditioner containing dragon fruit on your scalp, you can protect your chemically treated or coloured hair. This will keep the hair follicles open, allowing your hair to breathe and remain healthy and smooth. This treatment is not just for teenagers. Rich in vitamin C, this fruit becomes a great topical ointment. Turn a slice of dragon fruit into a paste and apply it to your reddened areas on your face or skin, then rinse with water. For best results, use twice daily. By combining dragon fruit with cucumber juice and honey, you can create a compound much like aloe that can soothe burned skin. Abundant in vitamin B3, dragon fruit can moisturize sunburned skin and release heat from the affected area. How Can You Make Dragon Fruit a Part of Your Daily Routine? Tired of the everyday apple or banana? Go ahead; you get permission to pick up the exotic fruit because it’s so good it should be forbidden. Dragon fruit is so easy to eat that all you need is a spoon to dig out its goodness, similar to a kiwi. Or, you can easily bite it right off of the peel for a quick fix. One dragon fruit will suffice as a snack, but soon you’ll be craving more. Try some of these recipes that call for dragon fruit here. Werner, As usual another one of your interesting stories. I hope you don’t mind I have forwarded this on, it reminds me of a movie of Denis the menace when Mr. Wilson had all his people assembled in the garden to watch the flowering of his plant which flowered at midnight and wilted : in the meantime a robber was in his house, Denis the Menace stopped the robber but in all the kerfuffle, the plant flowered and wilted and all the seated people missed it. Thank you for sharing. Love your blog. Wow! 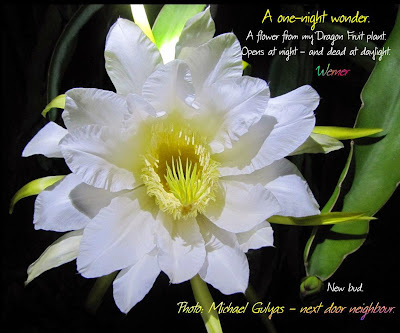 What a very interesting posting, Werner, and what a most beautiful flower. Very few people will ever have the opportunity to see. Thanks for sharing this “Queen of the Night” with us. I have seen this fruit at supermarkets and fruit shops, but I had never the inclination to buy one – but now I will. And if I get a plant, your growing information will come in handy. Thanks for sharing this. As usual, your research on any particular subject is very thorough. I have seen Dragon fruit in specialty fruit shops but always said to myself, 'I'll buy it one day.' Now after reading your blog on this fruit, I shall definitely buy one the next time I see it on display. Another very interesting posting, Werner. I was actually amazed that when I look for some information on Google, very often your blog is among of what comes up. I also realised that your “labels” on the right side leads also previous postings and to valuable information and some of your interesting stories. You certainly put a lot of effort in this. Thank for sharing it with us. I love Dragon Fruit, Werner. That is a beautiful story. What a wonderful and intersting story about the "dragons". I am glad to tell everybody that I got to know them during my time at Werner`s home. We ate them for breakfast every morning and you should have seen that red and juicy flesh, just like dragon-blood! I think the fruit got it`s name because of that! This fruit is another tropical miracle for me. We even watched the blossoms every night - in the morning they are gone. Thank you for sharing that miracle with me! Werner, that looks fantastic! I have never seen how Dragon Fruits grow. But I love to eat them -- on our travel in Vietnam we had them nearly every day. And they look so pretty on top of it. They are also occasionally available as an exotic fruit in Germany, but these are often not too tasty due to the long transport, so I don't buy them here. Kudos to your readiness to try new things! I really like and admire that. Wow Werner that is amazing, but then like me, you have a way with plants.. I love them.. Protein, an important ingredient for good health. Why do we have so much illness in our country? Enzymes are an important factor for good health.